Stromberg Time Manager – Enterprise Edition™ (STM-EE) is a sophisticated, client/server solution that enables organizations to manage and optimize time and labor resources. Designed for the large distributed enterprise, and businesses with complex employee time and attendance management requirements, STM-EE provides robust performance, centralized control, and virtually unlimited scalability. STM–EE has been designed with special emphasis on security, scheduling, and dynamic update capabilities. This human resource tool can support tens of thousands of employees in a single database while placing a premium on protecting your systems integrity by providing multiple levels of security. Enterprise Edition allows you to manage all aspects of employee time and attendance while reducing administrative costs. Additionally, STM-EE will effectively manage data collection, departmental resource utilization, project costing and cost center detail, enabling you to increase your organization’s productivity and profitability, and increase employee service and satisfaction. STM-EE supports industry standard databases such as Microsoft® SQL Server and Oracle, enabling seamless communications between STM-EE and virtually all major ERP and Payroll applications. Enterprise Edition provides a cost-effective, scalable solution for any organization with sophisticated time and attendance data collection and reporting requirements. For organizations that have made the commitment to client/server technology, Stromberg Time Manager – Enterprise Edition is the right answer to managing employee resources across the enterprise. The first and best name in user installable time and attendance systems is Time in a Box with advanced scheduler, step by step set up wizard, customizable toolbars, timecard editor, new Support Option, Stromberg i-Help, employee messaging, accruals, clock restrictions, bell ringing option, auto Internet update, and free Paychex, PrimePay, Ceridian, or ADP interface! Customers who’ve read and compared our newest software V2.5 to other systems find that Time in a Box V2.5 is easier to install and more feature rich than systems costing hundreds and sometimes thousands of dollars more. 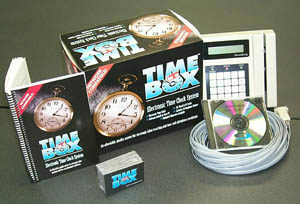 Time in a Box is the first and best name in quality, user installable, time and attendance systems. Don’t accept a low-quality substitute. The FP500 is the latest in Biometrics technology. Designed using modern defense industry technology, this unit requires no badge. It has a high impact ABS case and a specially designed acrylic scan window. Employees simply enter their PIN number and place their finger on the sanitary, dry, acrylic scan window. It’s fast, easy, accurate, and reliable. Compare and you’ll throw away “swipe units” and old style, unreliable biometrics devices. The FP500 is fully compatible with all time and attendance systems from Stromberg including Stromberg Time Manager, and Time in a Box. Add to or replace your present swipe units! No need for badges or swiping. Eliminates “buddy punching” and entry errors. It’s fast, clean, and easy. The DIGI2 is not a kit but a complete, ready to use time and attendance terminal that combines the ease of use of our standard TM3000 terminal and the fast, reliable biometrics verification of a two-finger geometry scanning device. A fast, efficient way to eliminate the problem of buddy punching. The Stromberg DIGI2 is a three-dimensional finger geometry, personal identification line of Time and Data Collection Terminals. Versatile, dependable, and fully functional, the DIGI2 allows for a quick 2-finger enrollment using either the right or left hand. The three-dimensional geometric DIGI2 device compensates for subtle variance in finger characteristics and offers an adjustable user threshold for enrollment and verification purposes. The DIGI2 is ideally suited for small or large employee based companies. Eliminate “buddy punching,” enhance information systems, and bring company standards to a new level with the Stromberg DIGI2. Most materials in this segment originated from the stromberg.com website in 1999. All Rights are copyright Stromberg.